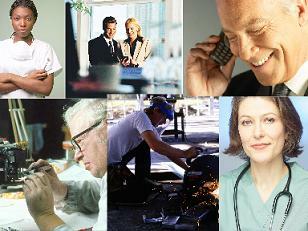 Click here for a free business plan guide. We just got a real investor!" "Here's my secret. I've been keeping it quiet until all the paper work was signed. "We got the money we need to take our business to the next level. And, the first award is available today. Just the right amount to put the finishing touches on our product, rollout our marketing plan, and hire the key people we need. "The investor says my plan has made me a valuable entrepreneur and there's more money coming as we reach each of the milestones in the plan. We're starting to live the dream, thanks to our team and the helpful tools on this web site!" Today more than ever before, having a solid business plan is what counts. There's so much money and so few good investments. Investors have a hard time telling which investment is better or worse than the other. Yet, somehow you've got to fund your business. The good news for you is that hundreds of thousands of other business people have proved there is an unfailing way to do it. Write out your plan, learn to talk about it clearly, and investors will be glad to put real money in your business. You can learn to write a plan that will set you up for the amount and type of funding you want, whatever it may be. You can write your plan at home or in your spare time using the tips on this site or by following the Business Plan Secrets Revealed Manual. It is my business to prepare people to present and market their businesses to investors. For over a decade, I've worked with some of the top investment houses in the U.S. buying and selling companies. I've put together and read hundreds of plans, and performed due diligence on countless others. Over one five-year span, I closed seventeen deals and raised over $760 million. And, I keep adding more. You too have the same chance to attract investors and money for your business. Can you afford to let even a single hour pass without finding out what the specialized knowledge within this web site can do for you? Here is all I ask--without cost, without any further obligation, simply fill out the small form below and download my free business plan guide. It will tell you how to go about writing a persuasive plan. A copy of this unique guide is ready for download absolutely free. It is the most valuable guide of its kind ever written. It's more than just an outline. This 15-page guide, with links to 4 in depth special reports and over 10 more resource links, explains the three steps to writing and promoting your plan. 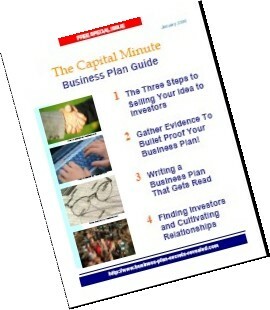 The guide was written to give away and it comes with a free subscription to the Capital Minute, the first "true" e-magazine on business plans. Your copy is ready for download. There's no obligation. Merely submit the form below now. After you submit your information you'll be taken to a new page to download your guide. You'll also receive an e-mail to confirm your Capital Minute subscription. Your information will never be shared. Mike Elia recently served as a Round I & II judge for the 2009-2010 Social Impact Business Plan Competition conducted by the Center for the Advancement of Social Entrepreneurship (CASE) at Duke University's Fuqua School of Business and the Center for Strategic Philanthropy and Civil Society at the Sanford School of Public Policy. Click here to learn more. Writers Workshop. Free business plan outline and helpful articles to make writing your plan easier. Books and software to help you avoid costly, embarrassing mistakes as you write your plan. Remember, how you say it is as important as what you say. How To Manual. In today’s crowded marketplace, it is becoming more and more difficult for businesses to stand out and distinguish themselves from their competitors. This manual shows you how to build a plan that separates you from other businesses. It teaches you how to write it in a compelling way, find investors to support it, and effectively market your plan. Industry Specific Business Plan Templates. This extensive collection of plans is the extraordinary result of a group of accountants, financiers and consultants from Europe and the United States with over 20 years of experience writing plans for businesses ranging from one-person start-ups to large multi-nationals! e-Magazine. Monthly e-magazine on business plans packed with articles and helpful tools to make your plan a winner. Click on the link to see the just released November 2006 issue. Articles. Occasionally I write "how to" articles covering everything from gathering information and writing a plan to crunching the numbers, finding investors and closing the deal for publication outside of the Capital Minute. You'll find them all here. What's on the Cover of Your Plan? Perhaps the most valuable paper real estate wasted! Learn why the cover of your plan is so important, how to tailor it to your readers needs and what to include on it. This link also includes a free sample cover page. Frequently asked questions about business plans. See the seven most popular questions. Have a question? Send it on. Remember the only bad questions are the ones not asked. Financing A Small Business. Startling facts about financing small businesses...and pointers to ensure your venture gets funded. Find Investors. How to find investors even if you are not "connected." Investor Databases. What you should know before you buy one. Pitching A Plan. Mistakes to avoid when meeting with investors. Ultimate Business Planner. A complete on-line video demonstration of the Ultimate Business Planner software package.